The Lakeland Terrier is a dog which originated from England in the area Known as Lake District. The breed was bred to hunt with farmers to catch vermin and foxes that threatened livestock. They are one of the oldest types of terrier breeds that still exist today, dating back to the 1800's period. This breed has been dubbed names such as "Patterdale", "Fell", "Cumberland" and the "Westmoreland terrier". 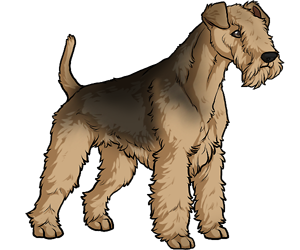 The Lakeland Terrier had not been accepted AKC stud book until 1934. Lakeland's are known as the smallest type of long legged black and tan terriers.